Slide: 1 / of 3 . I was not aware of such a scene, but thanks to Molin, I am now. Maybe several others are, too, thanks to the slew of headlines that have recently been trumpeting Molin’s own “incredible” marble music-making machine as a spectacle that will “blow your mind” and “amaze” you. For those who haven’t seen the Wintergarten Marble Machine, it’s a piano organ-sized contraption made out of birch plywood, some Lego Technic sets, and 2,000 marbles. When Molin winds a hand crank, the marbles cascade through a series of gears and chutes, plunking down on xylophone keys to create a cheerfully sci-fi harmony. It took 14 months of 40-or-so-hour work weeks to make. Molin is a musician from Sweden. His band, Wintergatan, plays spacey, orchestral folk-electronic music on instruments like xylophones and drums—but never anything as complex as the Marble Machine. Molin says he’s hacked other instruments to modify them, and once made a small hand-powered music box, but the Rube Goldberg-like Marble Machine is a first. To hear Molin tell it, the Marble Machine sounds like his version of Kevin Costner’s baseball diamond in Field of Dreams. After finding out about other hobbyists who make marble machines, he was “very hooked on this idea” of building one. Then he visited the Museum Speelklok in Utrecht, in The Netherlands. Music boxes, musical clocks, and street organs, some dating back to the 1500s, fill the museum. “I couldn’t get those machines out of my head,” Molin says. Molin set out to make his own, taking additional inspiration from this animated marble-and-xylophone machine. He documented the process in short YouTube clips, so you can see him in his workshop building the flywheel that stores energy, choosing the size of the teeth on the wooden gears, testing marble lifting mechanisms, and plugging pins into the programming wheel. This part of the Marble Machine is a grid, and works like an analog version of a MIDI machine. Move plastic pins around on the 22 tracks of the wheel, and the notes changes. The Wintergatan Marble Machine is almost incomprehensibly complicated. 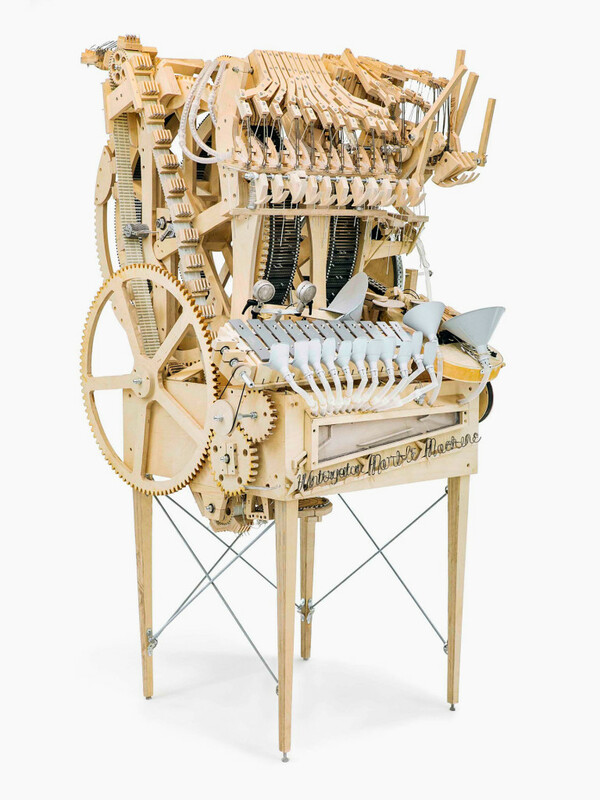 There’s a violin strapped to gears that connect to rotating belts that carry marbles that drop onto xylophone keys and then fall into funnels, all to go back through the machinery and get spit out again. At one point last summer, Molin says, he was so determined to make marbles drop out one at a time (instead of two or three at a time), that he scrapped six months’ worth of work and began iterating on his design. It’s a dizzying way to make music, and it’s equally difficult to describe the effects. “It’s like a band with a vibraphone,” Molin says. “This vibrophone has this vibratro that goes wa-wa-wa-wa, that adds to the dream-association side of the sound. Like a steam engine without the steam.” You can, of course, decide for yourself what the Marble Machine sounds like, by watching and listening above.